Thank you for taking the Age Friendly City survey. To capture the views of senior Canberrans, the Age Friendly City Survey was run over March and April 2018. During the consultation, 768 community members took the survey, one third of responses were online, and two thirds were received in hard copy. 80% of those who responded were over the age of 60, and 47% were over the age of 70. Hard copy surveys were delivered to key community locations and were available at Senior’s Week events. The survey was also available online on YourSay. Being valued as wise and energetic. A snapshot of key insights from your comments, feedback, and ideas can be found in the What We Heard report. We’re getting ready for a city which will be home to 500,000 people by 2030. We’re growing rapidly with 7,000 new Canberrans and 5,800 reaching seniority every year. We have more senior Canberrans now than at any other time in our history. Canberra is one of the best places to become a senior Australian – senior Canberrans are more likely to volunteer, stay employed and connected, socialise and remain active than senior Australians in other cities. Over the last three years the ACT Active Ageing Framework has set the priorities for our work to promote Canberra as an age friendly city. As this Framework is finalised we wanted to hear from senior Canberrans about what makes Canberra age friendly, and what is needed to ensure that as our city expands, Canberra continues to develop as an age friendly city – a city Canberrans are proud to call home, no matter what their age may be. 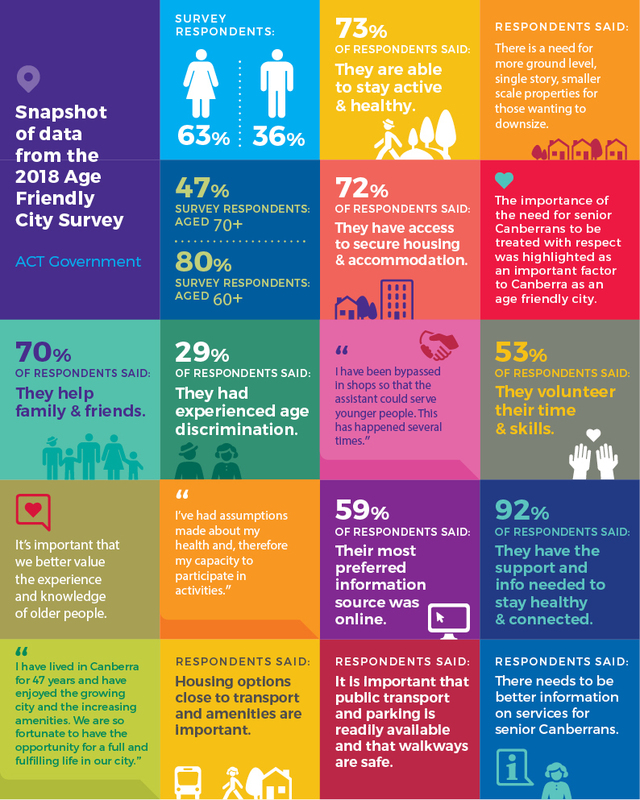 The results of the Age Friendly City Survey have provided us with information on key areas for further exploration and areas to address as the next stages of our work on supporting the continued development of Canberra as an age friendly city progresses. The views expressed by senior Canberrans will also inform the development of an Age Friendly Statement of Commitment to be announced in February 2019. Check out a snapshot of key insights from your comments, feedback, and ideas from the Age Friendly City survey. Ministerial Advisory Council on Ageing and the ACT Government began work on future directions for an Age Friendly Canberra. Ministerial Advisory Council on Ageing provides advice to the ACT Government on future work to continue to transform Canberra into an age friendly city.